At the time of the Great War, the sons of Russian nobility wrote to their mothers that they had food at the front, but had nothing to cook it in. In response, their mothers commissioned cookware by Fabergé, not knowing of any other sources. 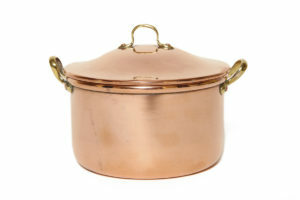 For the centennial of World War I, we present one such object: a copper and brass soup pot lined in pewter, with the imperial warrant and “K. Fabergé/war/1914” stamped in Cyrillic on its underside. Simple and utilitarian, lacking ostentation and splendor, it is an object unexpected from the jeweler’s workshops. Fabergé adapted to the drop in orders and wartime austerity measures by making items out of less expensive metals like copper and gunmetal. However, some of these items merely feigned austerity and there are some silver objects ‘gilded’ to resemble copper and brass. Nonetheless, Fabergé contributed much to supporting the war effort. Early in the war Fabergé offered his workshops for making munitions, but did not begin doing so until a year later when he finally received a response to his offer. His silver factory in Moscow produced hand grenades and casings for artillery shells and his Petrograd workshops made syringes and other smaller items. Fabergé lost much of his workforce to conscription and pleaded with the authorities to allow twenty-three to remain who were particularly vital to the business, including the only master enameler remaining. Fabergé wartime objects like this soup pot represent a turning point in history. The revolution and civil war that followed ensured there would not be a return to the opulence of preceding centuries. And so this soup pot, a Fabergé piece stripped of the gilding, enameling, and fine jewels long associated with that name, is made out of practicality rather than ornament, marking the end of an era.